Over the last few months, members of the Aries team have traveled internationally to participate in events and conferences, collaborate with partners, and engage with new audiences. Read a quick recap of Aries attendance of KAMJE, XMLink, and APE below. Want to connect with Aries staff at an upcoming meeting? Check our events page or contact us to schedule a meeting. The Korean Association of Medical Journal Editors (KAMJE) hosts a two-day conference each year. This year’s event focused on ethical issues, with presentations from journal Editors on the occurrence and manifestation of ethical problems, as well as strategies for handling these issues in medical journal publishing. 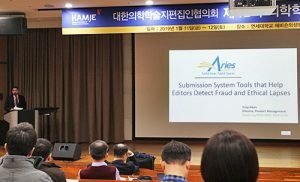 Aries Director of Product Management, Tony Alves, spoke about tools provided by online submission and peer review tracking systems which can be used to detect fraud and ethical lapses. His presentation addressed identity and authorship, quality assurance tools, Reviewer and Editor education, and FAIR data principles–with an emphasis on processes and tools available to journal editors and staff in systems like Editorial Manager. 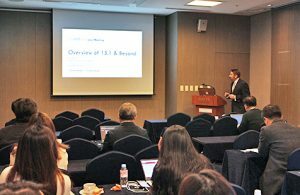 The XMLink User Group meeting, also hosted in Korea, was attended by approximately 40 Editors and journal staff from across 15 well-known medical journals including Journal of Korean Medical Science, Immune Network, Journal of Global Health Science, the Korean Circulation Journal, and many others. With the assistance of the XMLink staff, Tony Alves, Aries Director of Product Management, presented the new features planned for upcoming releases of Editorial Manager. Other topics discussed included configuring cascading workflows, the many ways to assign Editors and create Editor Chains, and ORCID integrations like Single-Sign On and Reviewer Recognition. Halfway across the globe, General Manager of Aries GmbH Rose Nottebaum and Client Development Manager Jason De Boer attended Academic Publishing in Europe (APE 2019) on behalf of Aries Systems in Berlin, Germany. “APE attracts a global audience of senior executives and influencers in scholarly communications, so it is always an informative and worthwhile event for networking with colleagues and keeping up to date with the latest issues in our industry,” said De Boer. Aries is a proud co-sponsor of APE. Check out our events page to see where Aries staff will be popping up next!